Purpose: Use this document as a reference for enrolling staff in a disability plan in ctcLink. *You must know the EMPLID or name of employee you want to enroll in the benefit. Enter ID in the EMPLID field. 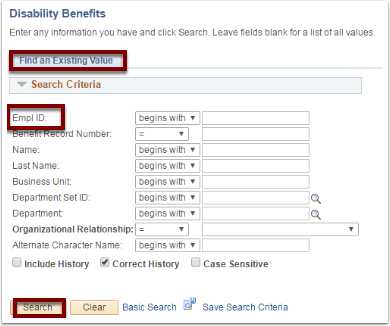 Confirm the employee is in a viable Benefit Program (if it says SB0 you will not be able to enroll them in the Benefit). Enter the desired date for Coverage Begin Date and Deduction Begin Date (typically this will be the same date, and for the first of the coverage month). Coverage Election should be Elect. Election Date will default (this is the date of entry and it will populate the system date). Use the lookup to choose the desired Benefit Plan.